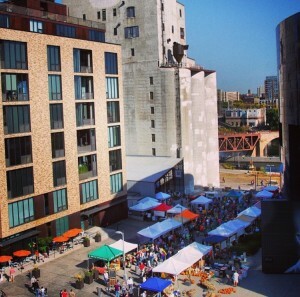 Guest Instagram heads over to Minneapolis, Minnesota this week to put the spotlight on Mill City Farmers Market – a market while only established 10 short years ago has grown to truly meet its mission of “inspiring and nurturing a healthy community” through its impressive food access and educational programs, as well as a commitment to sustainable farming and supporting its farmers with a community sponsored grant during times of hardship. Here, market manager, Jenny Heck, tells us how Mill City FM has met challenges, celebrated successes and won the heart of its community over the past decade. Farmers Market Coalition: Tell us all about Mill City Farmers Market. Jenny Heck: The Mill City Farmers Market was founded in June 2006 by Brenda Langton, whole foods educator, chef and owner of Spoonriver Restaurant, in collaboration with the Mill City Museum to promote Healthy Foods, Local Farmers. The Market is run by year-round staff. We have two full time and two part time staff and also have several seasonal, hourly Day Staff, interns, and volunteers each year who help put on the markets! At the outdoor markets we typically have 60-70 vendors. At our monthly indoor Winter Markets we have about 40-45 vendors. We work with over 120 vendors total because many of our vendors only come to the market monthly, or at certain times of the year (eg. blueberry vendor is only in during blueberry season). I think all of our vendors have interesting products and inspiring stories! Minnesota is known for lots of crops including wild rice, heritage grains and flours (our market is located in the ruins of the Gold Medal Flour Mill), bison, and maple syrup. Despite our short growing season, you can find most grocery items, locally sourced at our market: vegetables, seasonal fruit, pork, beef, lamb, goat, salami, fish, eggs, cheese, fermented foods, family-sourced coffee, preserves, pasta, bread, nuts, I could go on…. We also have an “art market” that is a rotation of vendors who occupy 4 tables at each market. We typically have 1 ceramicist, 1 woodworker, 1 jeweler, and 1 paper or textile artist. Some vendors who stand out are our immigrant farmers, largely Hmong, who grow organic produce and flowers on rented land and their family farms. Yes, we do have guidelines for who can sell at our market. First, all vendors must meet our Sustainability Statement, which, among other things, requires vendors to support conservation of our land and limited resources, use limited/no synthetic chemicals, practice humane and ethical production and sourcing, and follow sound business practices. We also seriously consider product duplication when accepting new vendors because we want all vendors to be economically successful at our market. Also, we don’t allow resellers at our market…with one exception: a local Minneapolis food/grocery co-op has a booth in our market where they sell limited, non-competitive pantry staples (spices, olive oil, bulk grains, milk, butter, etc.) to encourage one-stop grocery shopping at the farmers market! Our market is outdoors in downtown Minneapolis. We have one location in between the Guthrie Theater and the historic Gold Medal Flour Mill, overlooking the mighty Mississippi River. Half of our market sets up on a paved mall and half is under a covered “train shed” where trains used to pick up flour at the mill. Our market is weekly and outdoors every Saturday May through October and one to two times a month on Saturdays inside the Mill City Museum November through April. 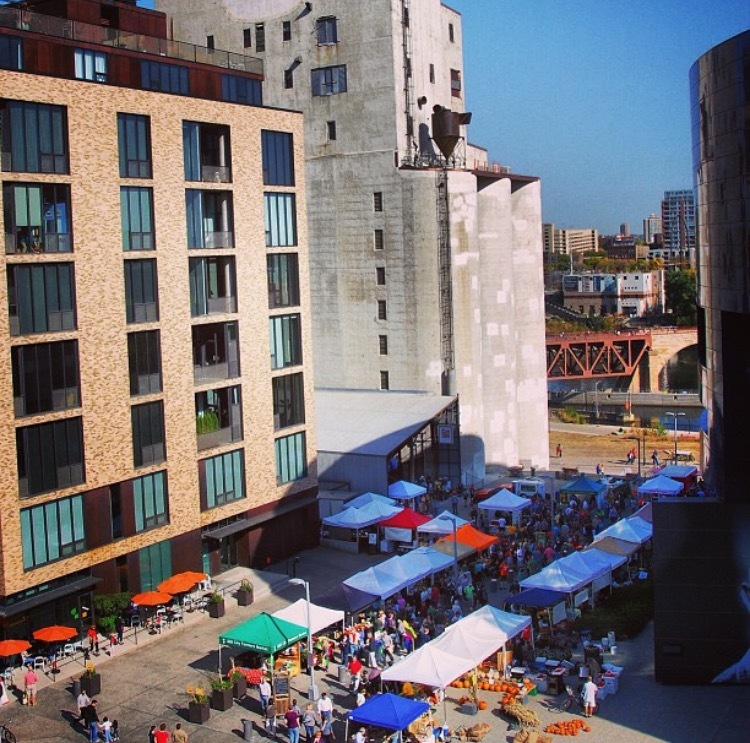 The Mill City Farmers Market is more than just a market. It is an experience enjoyed by over 6,000 guests each Saturday. We are actively involved in the community doing outreach to build a stronger, more sustainable regional food system. We build connections and foster relationships between farmers, entrepreneurs and customers in a fun and lively environment. FMC: How does Mill City FM inspire its community to come out to market? JH: Our mission is to “inspire and nurture a healthy community by building a local, sustainable, organic food economy in a vibrant, educational marketplace. We take the educational programming of our mission very seriously. Every Saturday we put on a free-to-the-public cooking class (“Mill City Cooks”) with professional chefs. Our Mill City Cooks program promotes seasonal produce, highlights our vendors, addresses current health topics, and educates our community how to affordably and easily prepare healthy foods. We also offer SNAP/WIC acceptance, live music, a free weekly community booth with a featured non-profit organization, and Power of Produce empowering kids to make healthy food choices. In addition, throughout the summer we have other activities including University of Minnesota nutrition interns who prepare and sample simple, healthy vegetable recipes 3-4 times a month (“Meet Your Vegetables”). For the kids, we have a monthly mini farm petting zoo and story telling by professional actors, and much, much more! We also have annual events such as Bread Festival, Oktoberfest, and Bike to the Market Day. Each of our market days are themed around an educational topic (eg. Stock Your Pantry Day, Sweet Corn Days, Brain Health Day, Backyard Gardening Day, etc. ), and we are always thinking of new ways to promote our vendors and inspire our community to prepare healthy, local food. FMC: Many markets struggle to find the best ways to promote their market. Does Mill City FM have any tips? JH: We put a lot of effort into our email newsletter and social media (Instagram, Facebook, and Twitter). We also market through our website, a partnership with the public jazz radio station, paid radio advertising, local news outlets (neighborhood newspapers and journals), mass-mailed incentives, and signs and banners in our neighborhood. My advice for other markets is to capitalize on email, social media, and google adwords. With promoted posts and targeted advertising, it is an excellent way to get the most of your advertising money. They also offer easy to understand analytics that allow you to get to know your audience really well. Social media is also a great tool because it encourages “word-of-mouth” advertising, which is trusted much more by consumers e.g. If someone shares our event or post and a friend of theirs see it, they will trust their friend more than a radio or newspaper ad. FMC: What are some challenges faced by Mill City FM and how do you work to overcome them? JH: One of our biggest challenges is communicating the real price and value of food. We are a primarily organic market and our farmers and food artisans grow and source products that are more expensive than processed food from supermarkets. Helping customers understand the value that whole, natural foods bring to their health and the health of our soil and environment is something we aim to do with our programing. We work very hard to educate our customers on this topic through our cooking demonstrations and by telling the stories of our farmers and the hard work they do, growing such high quality products. Increasing grocery shopping is another challenge of ours. We have created a vibrant community-gathering place with many dedicated shoppers and a great deal of educational programming. We work to carefully balance the amount of entertainment and space dedicated to educational activities and our focus on grocery shopping and supporting the livelihood of our farmers and producers. FMC: Inspire us! Tell us one way Mill City FM strives to make a difference in its community. JH: We are very proud of our farmers and producers. They work hard to bring their products to our market, and we work hard to support the success and sustainability of their businesses in return. One unique way we do this is through our Farmer Grants. The Farmer Grant Program began as effort by the Market to support our vendors in times of hardship and crop loss and has grown to support testing and research of farming practices and farm improvement projects. This program embodies our commitment to building a healthy, local, sustainable, and organic food economy. The grant fund was created through the generosity of our market community. We are honored to be able to offer these grants to our vendors. We currently have two different forms of grants for our farmers. First, we have The Organic Field Project Grant that is designed to provide funding to vendors who are working on improving their sustainable farming practices. It includes, but is not limited to, funding organic certification, infrastructure enhancements, season extension projects, product expansion, and improved sustainability of farming practices and soil management. Mill City Farmers Market is committed to the education of its’ community. Therefore, awardees are required to share highlights of their projects, learning’s and successes to build awareness and educate our broader community. Second, we have The Farmer In Need Grant that is designed to support farmers in time of hardship or crop loss. The livelihood of a farm can be vulnerable to an array of unpredictable causes for hardship or loss. While these risks are inherent to farming, this grant is intended to provide support to vendors who experience extreme hardship. Get on over to Instagram and follow Mill City’s story!